Who would not want to look young and beautiful? If you want a smooth complexion, try out Avene Serenage Serum with hyaluronic acid. Check out how this product works and what effects you might expect after the entire treatment. Avene brand released two deeply hydrating and smoothing fine lines products. They are especially for women who want to stop the time and prolong their youthful look. We are talking about day and night creams Avene Serenge. They contain hyaluronic and linolenic acid and thermal water. Hyaluronic acid provides the skin with moisturising and firming effects. Additionally, it smooths wrinkles and improves collagen synthesis. Linolenic acid promotes the production of lipids responsible for maintaining the proper level of water in the deeper parts of the skin. While the thermal water from Avene has soothing and regenerating properties. All things combined, bring tremendous effects. What are the properties of Avene Serenage creams? Serenage is a line of products used especially designed for mature skin care or with first symptoms of ageing. The components of such cosmetics smooth fine lines, brighten pigmentations, keep complexion in a good condition and prolong its radiant look. All products were dermatologically and opthymologicaly tested. Therefore, people with sensitive face and eye area skin, can feel free to use it. What is more, Serenage creams restore radiance to tired skin and the pearl particles included, brighten the complexion. 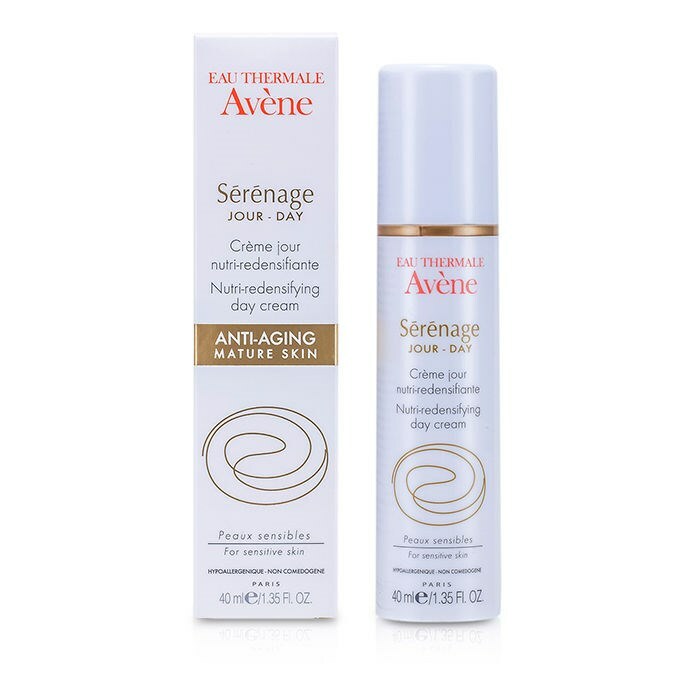 How to use Avene Serenage? Use both creams for three weeks, two or three times a year. Remember to thoroughly cleanse your skin before applying the products. Cleansing, make-up removal and toning are extremely important in every skin care routines. Apply a small amount of serum on your face and distribute it evenly. Do not forget about your neckline. Allow a few minutes to absorb and proceed with your make-up. You might as well use other face creams. One container contains 40 ml of the product, which is enough for a number of applications.